Thug Sentenced After Stealing Car of Man Who Was Nice Enough to Give Him a Ride Home, LIVINGSTON, November 19, 2014 - Larry Hernandez was sentenced to the maximum punishment of ten years in prison on November 17, 2014. Hernandez was arrested after stealing a Honda Civic from a good samaritan who had given Mr. Hernandez a ride home from a laundromat. 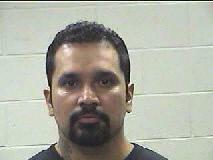 Hernandez then became intoxicated and wrecked the vehicle into a tree in Walker County before being hospitalized and subsequently arrested for Unauthorized Use of a Motor Vehicle. He waited until the day of trial to change his plea to guilty and have a hearing in front of the 411th District Court Judge Kaycee Jones to determine his punishment. Hernandez admitted to being imprisoned for two prior State Jail Felony offenses and Prosecutor Brian Foley entered a Robbery judgment into evidence where the defendant had pulled a knife during a San Antonio car jacking incident. Foley also presented evidence that Hernandez had previously been a member of the Mexican Mafia prison gang before. Jones entered the maximum punishment of ten years in prison. District Attorney Lee Hon wished to thank the members of the jury panel, "The citizens of our county truly helped make a difference today. It is no coincidence that the defendant chose to change his plea once members of the community arrived at the courthouse ready for jury service."